Koley Jessen promoted 4 attorneys to shareholder status effective January 1, 2015. Our new shareholders include lawyers from our Intellectual Property, Business General Counsel, Mergers & Acquisitions and Litigation practices. “We congratulate our new shareholders. The promotion of these talented attorneys speaks to the importance we maintain on our core values of integrity, client focus and respect for others. 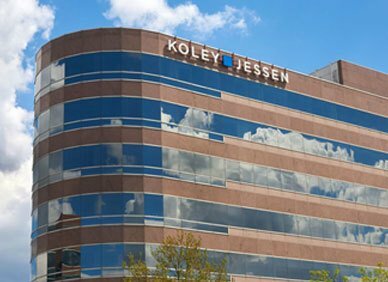 They are a talented group whose innovative ideas and strong work ethic will only strengthen our partnership,” said Mike Hupp, President of Koley Jessen. David Goeschel is a member of the Firm’s Intellectual Property and Business General Counsel Practice Groups. His practice focuses primarily on the areas of commercial and technology agreements and the protection and commercial exploitation of U.S. and foreign intellectual property assets. He has extensive experience structuring and negotiating a wide range of general commercial transactional documents, with a focus on supply chain management and technology- and e-commerce transactions, including software, content, trademark and technology licenses, and web development, web hosting, advertising and similar business arrangements. He routinely advises clients with respect to best practices on the Internet and works closely with e-commerce businesses in establishing form agreements and other legal terms and conditions, including privacy policies and terms and conditions for a variety of websites and web-based businesses. Kristin Krueger practices in the areas of litigation, bankruptcy and creditors’ rights. Kristin’s general litigation practice is concentrated in commercial and business litigation, and she assists clients through all stages of the litigation process, from commencing the litigation or providing a defense, conducting discovery, engaging in motion practice, to participating in the trial and appellate process. Kristin’s bankruptcy and creditors’ rights practice involves representing a variety of clients in connection with all types of bankruptcy proceedings, including creditors, debtors and creditor committees. She represents clients in workout situations, both inside and out-of-court. Kristin has experience litigating cases in Nebraska state courts and in federal courts throughout the United States and also assists clients in arbitration and mediation. Josh Norton’s practice is focused in the areas of mergers and acquisitions and general corporate law. Josh routinely represents closely-held businesses, strategic acquirers and private equity sponsors in a wide range of middle-market M&A and private investment transactions. As part of his practice, Josh counsels clients with the structuring, due diligence, negotiation and execution of acquisitions, mergers, divestitures, recapitalizations, restructurings and controlling/non-controlling investments across a broad spectrum of industries. Josh also represents entrepreneurs and growth companies with start-up and formation matters, capital raising, buy/sell agreements and related corporate governance matters. Anshu Pasricha has a broad, multidisciplinary practice that includes extensive experience in counseling strategic corporates and private equity sponsors in domestic and international mergers and acquisitions, joint ventures, divestitures, and in general corporate matters, together with ’33 Act and ’34 Act compliance issues. Anshu has executed more than 50 domestic and cross-border M&A transactions with aggregate deal value in excess of $40 billion in a wide variety of industries. Anshu has also advised clients in connection with making, restructuring, and exiting their investments in Australia, Latin America, Europe, the Middle East, and Southeast Asia. Anshu also advises on business development strategy involving emerging markets by way of joint ventures and licensing and distribution transactions, engaging hostile joint venture partners in extra-contractual negotiations, and FCPA due diligence in the context of M&A and joint venture transactions.